An Easter message on a public school sign. Insert secularist freakout here. A local news affiliate actually did a story on the sign. Can you believe it? Of course, they located some outraged people. 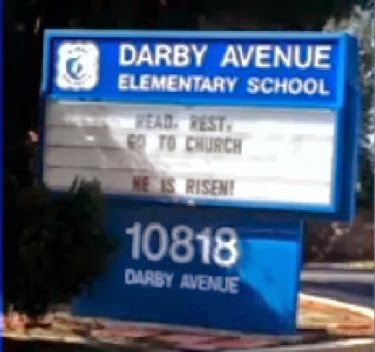 Turns out that a teacher at Darby Avenue in charge of changing out the marquee visited the school during the quiet of Saturday night, spelled out the Easter Sunday message, then took it down Sunday night. If the government were truly neutral on religion, this wouldn't be an issue at all. A school could put up a religious message or a secular one. It would be up to the school. But now, you've got Californians bleaching their eyes to unsee the unsolicited mention of Christ. It sounds like a teacher changed the sign, according to the Blaze. Something tells me that teacher will be looking for work sometimes very soon. I won't expect the union to have their back. Dear Plumb Dumpling. This is your psych meds. We miss you. We are in your medicine cabinet and would appreciate that you please contact us ASAP. Please step away from the keyboard. Sincerely. Plumb Dumplings psych meds. A fetus is not "distinct" until it survives birth. "Developing" is the key word. A blog may develop into a baby human being if I allow it. You want to force married couples to give birth to children they cannot afford and/or do not want. That is Nazi stuff. It is evil. The medical definition of abortion: You are crazier than a box of Steve King. So if a black woman is having a white baby, is it okay for her to abort? How about vice versa? God and i have a private relationship. Two is company and three is a crowd. Embryos as threshed grain? LOL. You "expressed" the gene study brilliantly! Rational, reasonable, articulate and coherent. Of course, I don't like the idea of my child's genetic make up, being exploited, as gateway experimentation, for some gene therapy, IVF wackos! Trust me, my "feelings" are more than just hurt! I love my daughter how she is! And I like how she "wears" her genes to work! Don't mind legitimate, authentic scientific inquery under appropriate ethical safegaurds and guidelines. But, unfortunately, having stated that, I do not believe that many will comply. For too many, the obedience to follow the rules of law, are for "other" people. Did you see the latest marijuana study? they get the pot brain rot! This is illogical. So, by your logic a prematurely, delived by c-section "blob" will never be a human being. You speak of Nazism. Maybe you should check out Margaret Sanger, as she and her eugenics movement was adored by Adolf Hitler. Only a facist regime would adore ripping a developing human being from the mother's fetus, and call it "reproductive health". So legalistic. Slavery wasn't illegal either, yet still wrong. Intentionally taking an innocent life is murder. Full stop. Now if want to continue to play your crazy word games or bring up the fact of miscarriages as a dodge, I can't help you. But down deep, you know damn well what I am talking about and if you support abortion, then you support murder. Now please, entertain us with more of your crazy talk. Were the slaves inside the master and sucking blood through an umbilical cord? Poor analogy that fetus fetishists use when they have run out of sane argument. Which is always. Abortion is not a crime and we are discussing public health. You spend too much time in LaLaLand. What is especially troubling is your delusion you are seen as caring and sane. I assure you, that is far from the truth. And folks with delusions like yours occasionally act on those delusions. FBI LOOK SHARP - THIS IS THE ROEDER PERSONALITY. iMPORATANT WORD: "delivered." I stopped reading right there. Nothing that comes after can be worthwhile reading given the beginning. I wonder what dreck you wrote. Which I suppose is the reason partial-birth, late term abortion "doctors" must ensure the head of the child doest come out alive and crying in pain before the spinal column is snipped... or else that pesky Kermit Gosnell situation occ uccurs. Thanks for educating me in discredited pseudo science that life doesnt begin until "delivery"
Fetusporn. When you stop whacking off, if you want to discuss abortion as a public health issue, I am more than willing. Are unborn babies human? Yes, they are. That's the obvious truth avoided by those like you who look to justify their support of inhumanity. Fetusporn. When you stop masturbating, if you want to discuss abortion as a public health issue, I am more than willing. A fetus is human, it is alive, it may be unwanted. I forgot to ask you and I should have asked in the beginning. Are you for criminalizing abortion? Yep. I thought "landowners" was particularly odd. Obviously owning land doesn't have anything to do with abortion. And in 2014 land ownership isn't exactly the same measure of wealth and social status as it was in the feudal era. It's certainly possible to own some land in a rural area and not be wealthy, compared to someone who might be paying a few thousand dollars rent in somewhere like Manhattan. But yeah there isn't much of an attempt here to actually make sense. Yes, I am in favor of criminalizing obscene attacks on our own humanity. Of issue then become culpability and mitigating circumstances in effectively enforcing such a law. That is what I thought. i just wanted to be sure if you are as big a douche as I thought you were. You are. Kiss my sweet petunia, TurdLips. Jewish law not only permits, but in some circumstances requires abortion. Where the mother's life is in jeopardy because of the unborn child, abortion is mandatory. An unborn child has the status of "potential human life" until the majority of the body has emerged from the mother. Potential human life is valuable, and may not be terminated casually, but it does not have as much value as a life in existence. The Talmud makes no bones about this: it says quite bluntly that if the fetus threatens the life of the mother, you cut it up within her body and remove it limb by limb if necessary, because its life is not as valuable as hers. But once the greater part of the body has emerged, you cannot take its life to save the mother's, because you cannot choose between one human life and another. Tell us some more about your plan for 1 in every 3 women of America. I am sure I will find it most entertaining. Oh, so now we move into the throw out bullish!t statistics phase your zaniness. Though we do know your plan for unwanted children. The Talmud didn't exist when Jesus walked the Earth. And even if want to argue that what it accounts represents traditional Jewish teaching, so what? Christ clarified that divorce was permitted by Moses because of the hardness of the Jew's hearts. 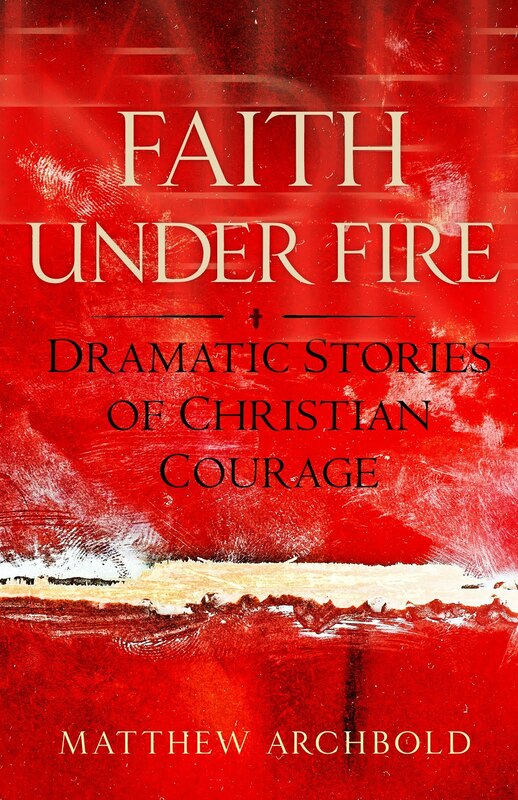 Thankfully now, we have the Church, inspired by the Holy Spirit, to provide us authentic teaching. So, I'll let the Church that Jesus established speak for Jesus. May the Immaculate Heart of Mary offer soften your heart to realize what abortion actually is. What if the baby is unwanted after it's born? Should the parent be able to terminate it then as well?